One Room Challenge Spring '18: Reveal Day! It’s week 6 and the end of the One Room challenge! aka Reveal Day!! I'm so excited to have completed yet another ORC and to share it all with you. If you are new to my blog, I’m so happy you've stopped by! I’m Jana Donohoe, an interior designer in Fayetteville, North Carolina and the mom of 3 busy kids. I specialize in residential remodels and family friendly interiors. This is my 4th One Room Challenge as a guest participant. If you missed the week by week updates and you want to see how I got to where I am today, you can catch up by clicking week one , two, three, four and five. You can check out my past One Room Challenges here. Before I give you the goods, let’s take a quick look at where I started 5 weeks ago. My dark boring foyer and my 37’ bowling alley hallway. To say it lacked interest might be an understatement. Are you ready to see some AFTER photos now? Without further delay I bring you my new foyer and hallway. Now, I think this is the feeling of *welcome to my home* I have always wanted! 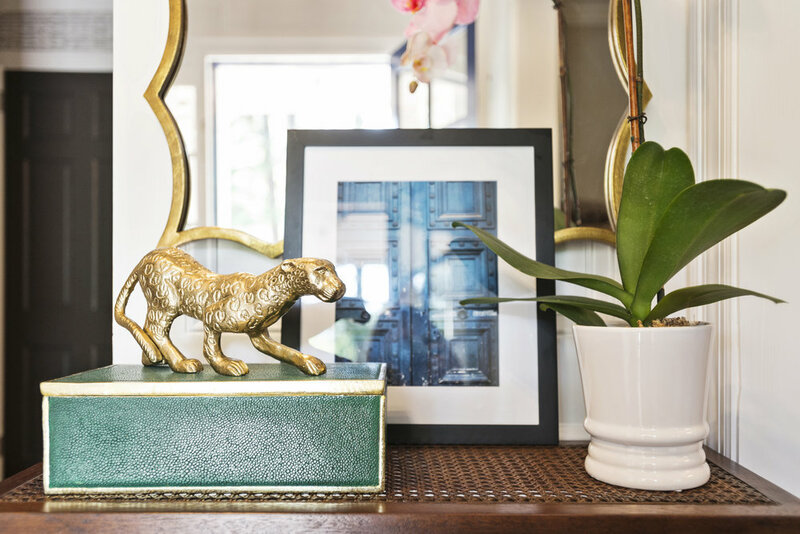 This little Target console table was used as a stand in for a chest I ordered that did not make this reveal. I really like it, so it might actually stay! And if you watched my Instagram stories you may have seen that my mirror showed up two times broken in pieces. Third time was a charm! While I was updating the foyer and hallway I also decided my craft and linen closets needed to be cleaned out and reorganized. So, here are my pretty, clean closets. No hiding things in the closets here anymore. This is the real deal. Note: My wrapping paper organizer did not make the reveal but you can check it out here. I seriously never thought my linen closet would look so organized. Let me tell you about my favorite item in this closet. **The blanket bag**- it's da bomb! (Do people still say that?) I have, I think, 8 - maybe 9 - blankets in that bag. Those blankets would have taken up at least 2 shelves in this closet if left to their own devices. OK- I might have a small throw pillow problem! And I donated a bunch, too. LOL! Well, what do you all think? A little better than the before? Thank you all for following and cheering me on these last few weeks. It really means a lot to me. I love each and every message I receive from all of you! Keep them coming, please! Be sure to check out the other great participants posts here. I know what I'll be doing this weekend and it's going to be filled with lots of pretty! If you haven't yet, I invite you to subscribe to my blog and connect with me on Instagram here. Please comment below and let me know what your favorite part of this makeover is. I'd love to hear from you.